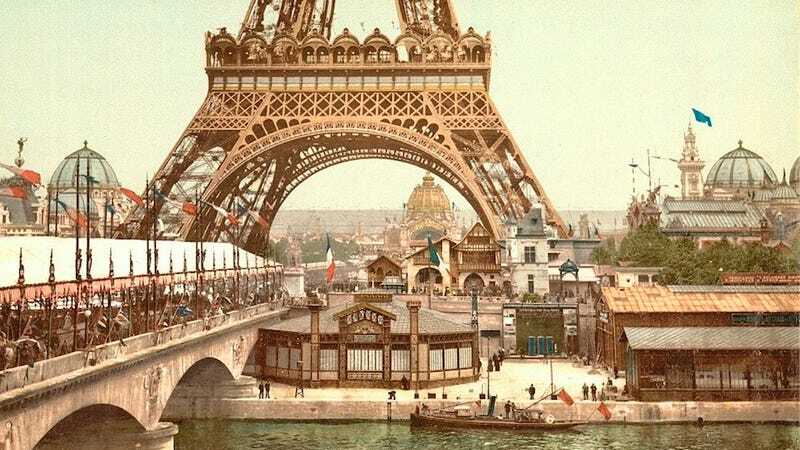 The Paris World's Fair of 1900 (also known as The Exposition Universelle) was held in Paris between 15 April and 12 November. On display were many new inventions: matryoshka dolls, Diesel engines, talking film, and the telegraphone. But more importantly, the architecture and design of this World's Fair brought the wonderful Art Nouveau style into popular culture. These photos and illustrations of the Fair show why the world fell in love with Art Nouveau. The Le Tour du Monde pavilions displaying a collection of exotic oriental architectures – a Siamese pavilion, a Japanese pagoda and an Indian pavilion. Cinéorama, an early film experiment by Raoul Grimoin-Sanson. It simulated a ride in a hot air balloon over Paris. The system consisted ten 70mm movie projectors and a 90x9 (295x29.5 ft) metre screens. It lasted only three days, because it was shut down by the police for safety reasons: the projectors lights caused extreme heat. And here's how it moved. The photos above are from Brooklyn Museum and The Library of Congress, made by Henry William Goodyear, except when noted otherwise.